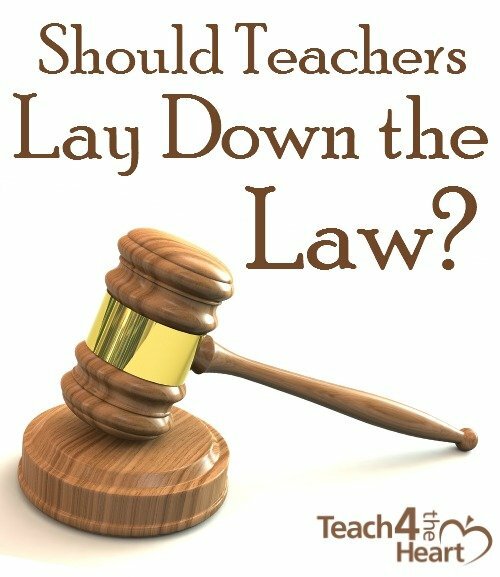 >> Should Teachers Lay Down the Law? Some teachers, in an effort to get their students to like them, fail to deal with classroom management and discipline issues that arise. Others, in an effort to get their students to respect them, decide to lay down the law. But neither of these approaches typically give those teachers what they desire. We talk extensively about why you’ve got to deal with those first discipline issues in this post here. But what about laying down the law? Consider a few scenarios (that I’ve seen firsthand)…..
A young teacher shows up for his first day at a new school. A middle schooler who has somehow discovered his first name cheerfully chimes, “Hi, Mr. Sam” instead of the more appropriate “Hi, Mr. Anderson.” The young teacher, in an effort to show his authority and demand the respect he deserves, requires that student to write “Mr. Anderson” 5,000 times. A young student teacher wants to show that she will not put up with any misbehavior. So she hands out detentions like candy for the tiniest of infractions. Since that’s technically school policy, her advisory teacher backs her. But it’s clearly a bit excessive. Clearly these teachers have laid down the law. But have they garnered the respect they desire? Probably not. In fact, they’ve probably lost quite a bit of their students’ respect and likely also hurt their chances to make a real impact in their lives. That’s because having great classroom management isn’t about showing the students who’s boss. It’s about being caring and compassionate while showing the students you have high standards that you expect them to meet. So if you shouldn’t lay down the law, how do you establish your authority and get your students to respect and listen to you? Begin with lots of structure. The start of the year is not the time to pull out your funnest games and outrageous group activities. Your students need to understand your structure before they can handle more freedom. If you establish structure early, you should be able to implement fun activities later without your students getting out of control. Be strict but also kind. For some reason, lots of teachers assume this is an either-or. You’re either strict or you’re nice. But that’s not true at all. The best teachers are both. They have high expectations that they absolutely insist are met, but they treat their students with kindness and understanding throughout the whole process. Be professional. Being professional doesn’t mean you’re distant or boring. But it does mean that you don’t act around your students the way you act around your friends. In other words, you’re friendly but not familiar. Check out the post, “How to Be a Professional Teacher Without Being Distant” for more thoughts on striking the right balance. Be ready to give consequences if necessary. While you should try not to start the year by giving out major consequences, you do need to be ready to go there if necessary. It’s pretty rare to have a big issue right out of the box, but if you have some of the same students as you’ve had in the past (or if you just have some really challenging students), it could happen. So do realize that if you have a major issue, then you do need to deal with it and give appropriate consequences. What strategies do you use to combat discipline issues during the start of school? Have you ever laid down the law? What happened when you did? 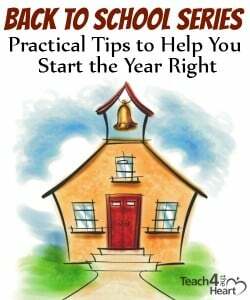 Don’t miss the rest of our back-to-school series. You can see a list of all the posts in the series here.